Located in Mexico’s popular Riviera Maya, Xcaret is an eco-archaeological park with over 50 attractions. 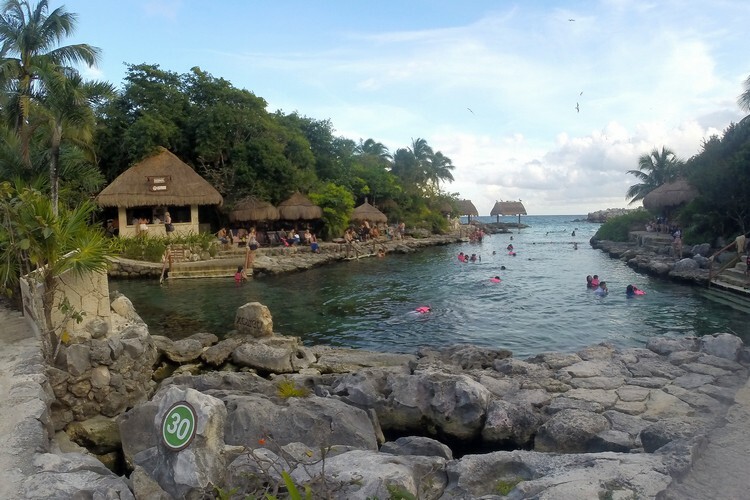 Visitors come to Xcaret to snorkel with fish, explore underground rivers and caves, learn about Mayan culture, see wildlife and enjoy its tropical surroundings. It has a lot of similarities to nearby Xel-Ha Park. This family friendly adventure park is situated 60 km south of Cancun International Airport, 6 km from Playa del Carmen and 57 km north of Tulum. It takes about an hour to drive to Xcaret from Cancun. We have visited the Riviera Maya several times before, but this was the first time we visited its amusement parks. 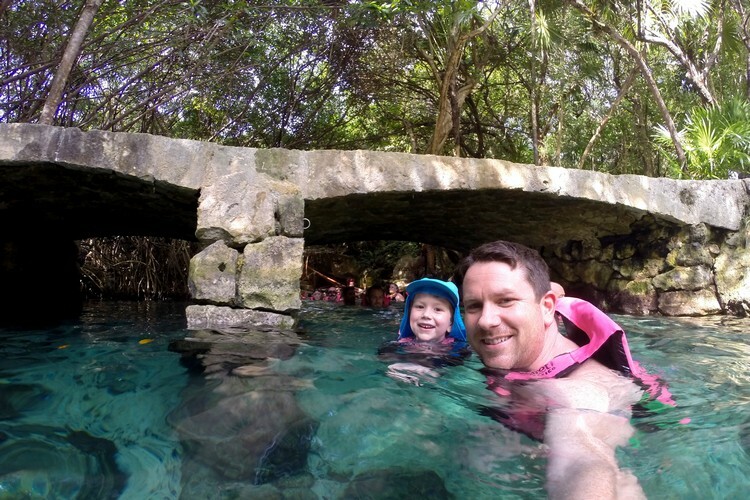 After researching each one, and reading the recommended ages (our youngest is 4 years old), we decided to visit Xel-Ha and Xcaret on our most recent trip to Mexico. 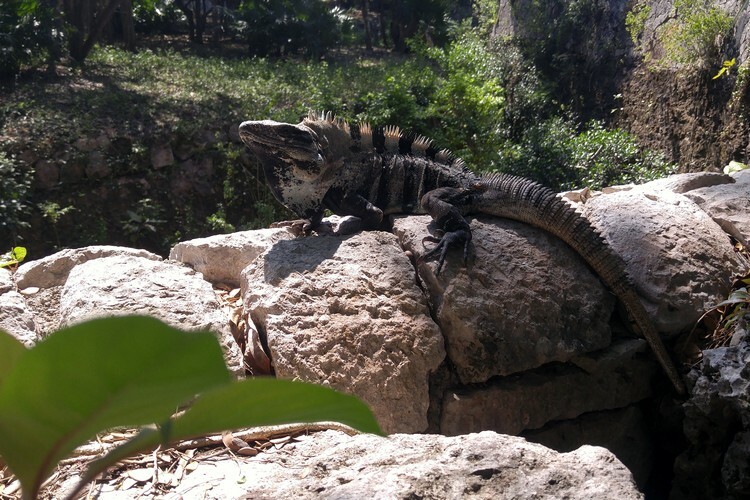 Should you visit Xcaret? Is it worth it? In our opinion, the answer is yes. However, you’ll want to be prepared before you go. We learned a lot during our first visit to the park. The big realization was that we were not fully prepared for our visit. The purpose of this post is to share our firsthand experience with you so you don’t make some of the mistakes/assumptions that we did. 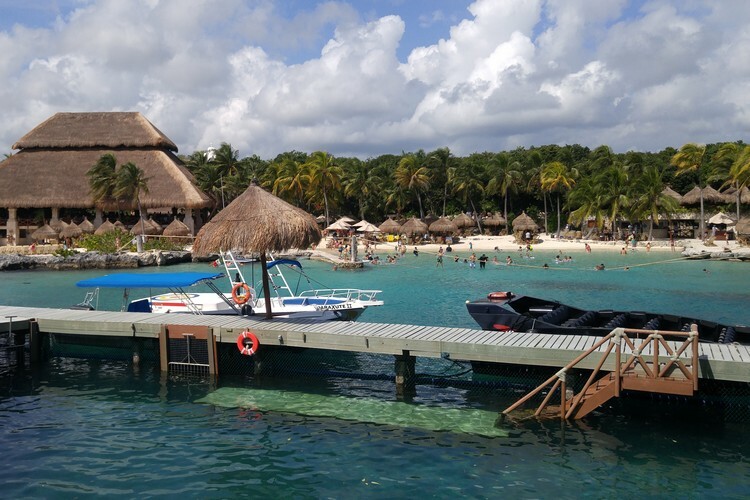 Below are a few things we learned while visiting Xcaret. 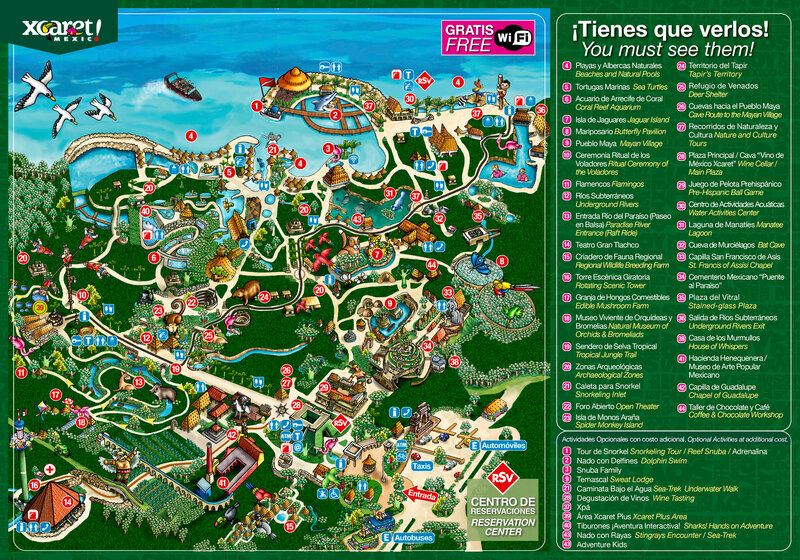 Xcaret is over 200 acres (81 hectares)! 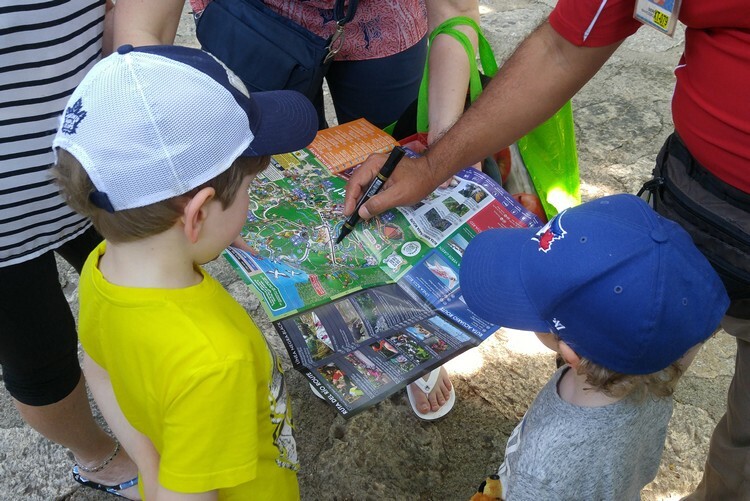 You’re unlikely to explore the entire park in one visit, especially with young children. It’s just too big to do it properly in one day. We suggest you take a look at the map and plan your activities in order of location. A good way to organize your day would be to group your activities by sections, like South, North, East and West. Or, by water activities versus land activities. For example, you would do land activities in the morning and evening, and water activities mid-day so you avoid changing multiple times a day. If you’re traveling with young kids, we suggest you bring a stroller or rent one at the park. They have single (299 pesos) and double strollers (399 pesos) available to rent. It’s a big park, so this is money well spent. Our boys were 6 and 4 years old during our visit and they complained that we were walking too much. Keep in mind, it’s quite hot during the day. Bring hats and sunscreen. If you’re traveling with kids 4 years old or under, admission to the park is free. Children between the ages 5 to 12 years old will get a discounted rate on admission. It’s a good idea to bring or rent a stroller if you have younger children. Most of the park is flat and there are stroller friendly paths to most exhibits. Kid friendly activities include: viewing jaguars, turtles of all sizes, sharks, manatees and coral reef aquarium. Children’s World, one of the newest attractions at Xcaret, has water slides, hanging bridges, cenotes, a parakeet habitat and a playground. 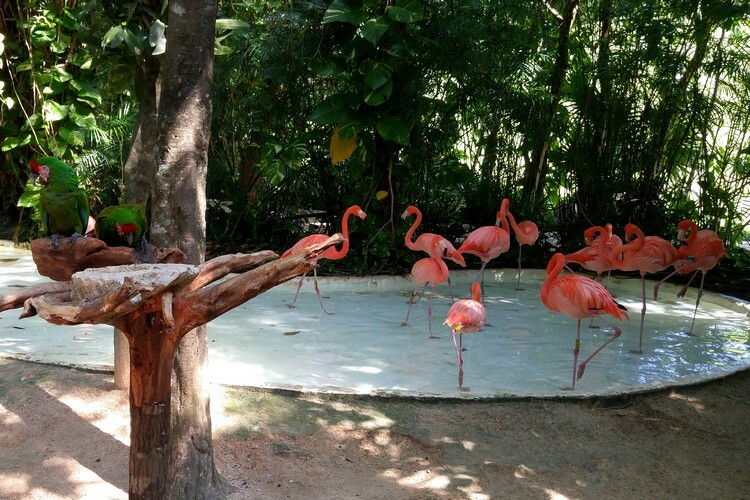 There’s also a butterfly pavilion and wild bird aviary inside Xcaret. 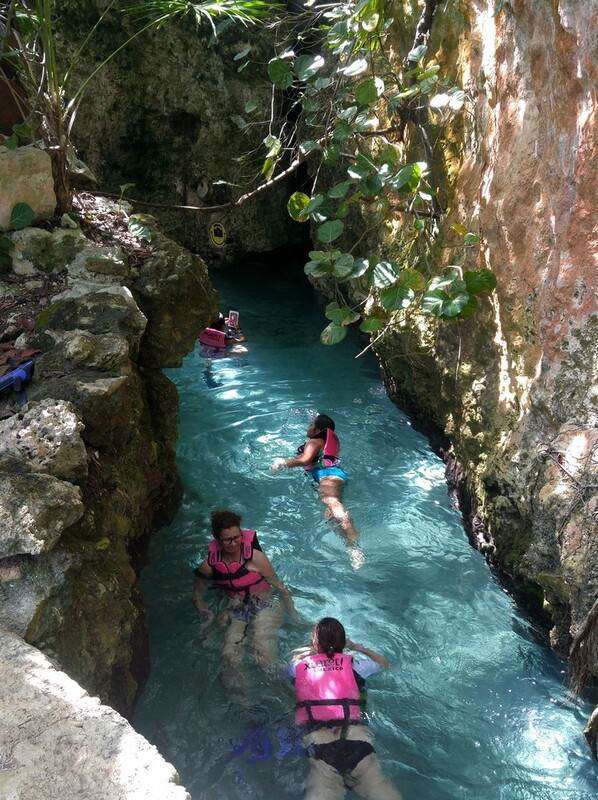 Information about Xcaret activities can be found here. Xcaret is NOT all-inclusive. If you are staying at an all-inclusive resort in the Riviera Maya, this may feel like a surprise. Some of the other adventure parks in the area are all inclusive, so this can be confusing. You will need to bring cash and a credit card with you. There are extra charges for day lockers, strollers, snorkel equipment, towels, food and beverages. We made the mistake of not properly planning our time inside the park. We arrived early, around 9:30 AM. On the surface, this seemed like the right idea. However, if you want to attend the evening shows, we learned that arrival time was not ideal. Our boys were pretty tired and cranky by 6:00 PM and there was no way they would survive the Xcaret México Espectacular evening show. The result – we did not get to see the big show. This was unfortunate because we’ve heard it’s the highlight of Xcaret. We did see some of the actors in costume before the show began. It looks like quite the spectacle. You can find some video footage on YouTube if your interested. The lesson – don’t make the mistake we did. Plan your visit to include the evening show. If you have young kids, it might be wise to arrive at the park late morning or mid-day. We did watch the evening horse show. This Mexican cowboy show is quite entertaining and worth watching. If you haven’t had dinner yet, consider eating at La Cocina (located near the park entrance) because it’s right beside the horse show. The restaurant has some of the best seats to watch the show. 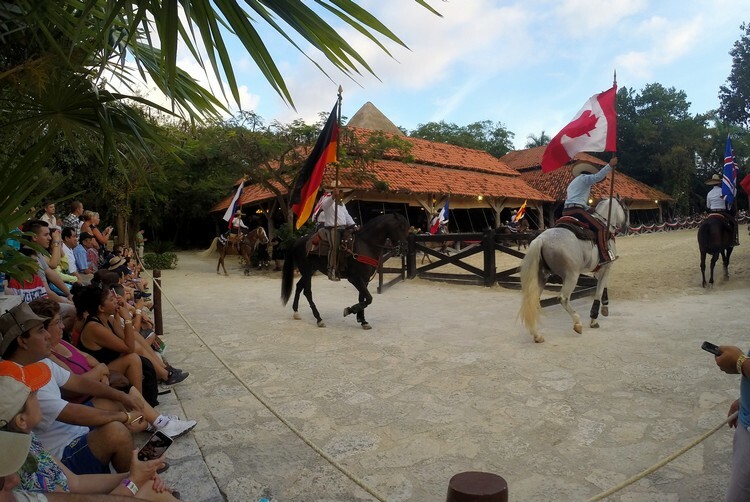 The horse show finishes before the Xcaret México Espectacular evening show. 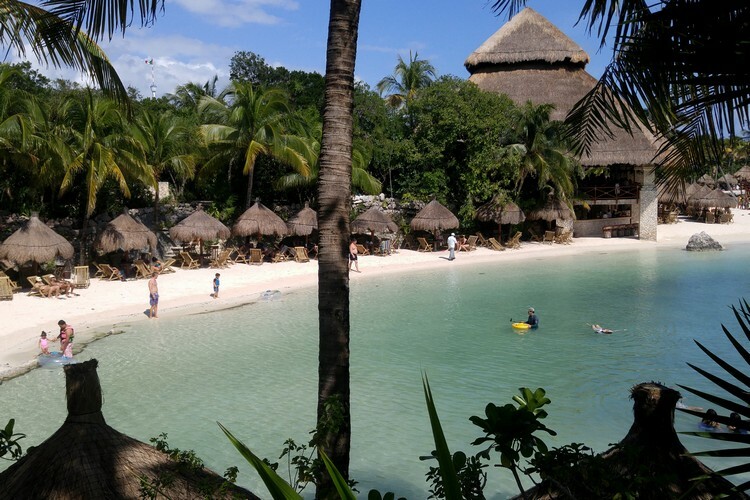 If your hotel or resort does not have a nice beach, you may want to save some beach time for Xcaret. It’s beautiful stretch of beach with safe and calm water, which is ideal for young children who cannot swim. The water is warm and crystal clear (see photo above), and the sand is silky smooth. There are plenty of chairs and loungers available. To keep the cove water clear, and the fish safe, you’ll want to bring special sunscreen with you. Xcaret asks that guests only use biodegradable sunscreen, because normal sunscreens contain oils that pollute the water and cause illnesses to the marine life. The park strives to protect the environment and they ask visitors to do the same. If you don’t have biodegradable sunscreen with you, you can purchase a bottle inside the park. Otherwise, it’s a good idea to purchase before you leave home. You can order it on Amazon here. 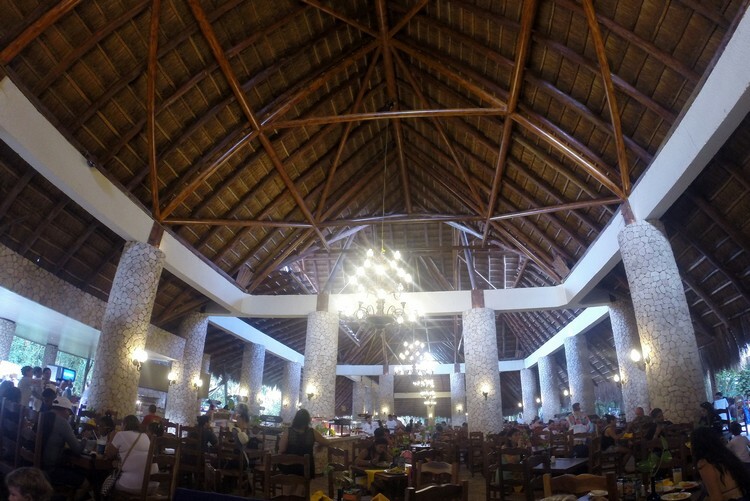 Because Xcaret is NOT all-inclusive, you may find that the expenses start to add up. 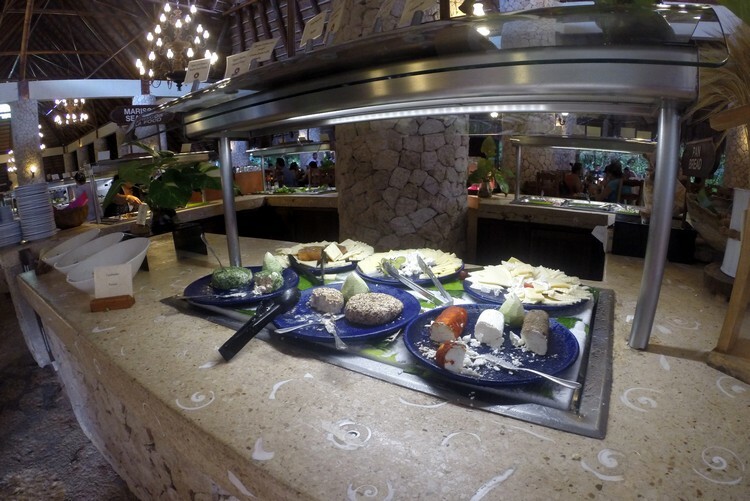 If you plan to eat while inside Xcaret, we suggest you purchase the Xcaret Plus package. Full details here. 1 Buffet lunch including 1 beer and unlimited beverages (soft drinks, flavored waters and coffee). There are 5 restaurants to choose from. The buffet costs $29 USD per adult, so if you plan to eat at the buffet, the price of the Plus package will cover this cost. 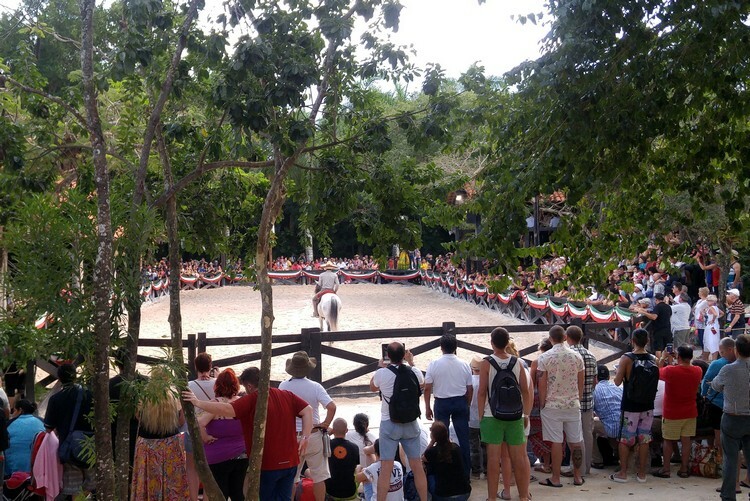 Xcaret has optional activities for additional cost. Here’s the list. 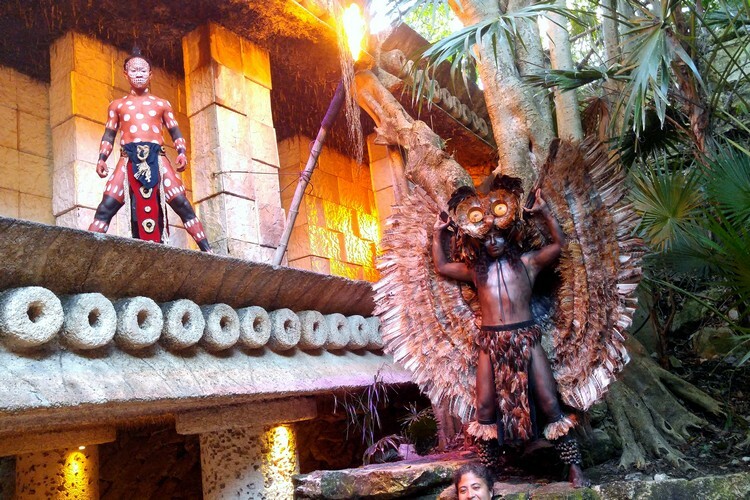 There are lots of things to do at Xcaret. Too many, actually (see the list of activities here). So, you’ll need to make some decisions. One activity you can’t miss is swimming and snorkeling through the park’s network of underground rivers and caves. These sacred rivers and caves are unique to the Riviera Maya. We underestimated the length and darkness of the caves, but you can exit at several stops along the way if you find it too long. Our 4 year old was a little scared of the darkness, and my father and mother (the kids grandparents, age 70 and 75 years old) found some sections to be too long. Make sure you get a pair of fins. They make swimming through the caves so much easier. If you purchase the Xcaret Plus package, you’ll want to find the dedicated Area Plus facilities to store your belongings. If you purchased basic admission you’ll want to find day lockers to rent. Last minute personal items, like shoes, hats, towels and wallets, are stored in a locked bag and transported to a station at the end of the river. You keep the key with you and pick up your belongings at the designated station. This is a nice service but it can be a little confusing. When in doubt, ask questions. 8. What to pack for a trip to Xcaret?